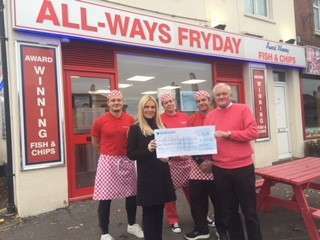 We have been supported by All-Ways Friday in Hamworthy for the last year and they have raised an incredible amount of £1000 for Leaf Cancer Charity. Owner Ken Mackenzie presented me with the cheque this week which will go such a long way to helping local patients and families affected by a blood cancer. Ken would like to say a big thank you to all customers who have kindly supported their fundraising. I would like to say a special thank you to Ken and his managers Tom, Louise and Adam for all of their time and effort and to everyone who has got behind their fundraising.